8 Factors To Consider Before You Purchase The Pressure Washer! 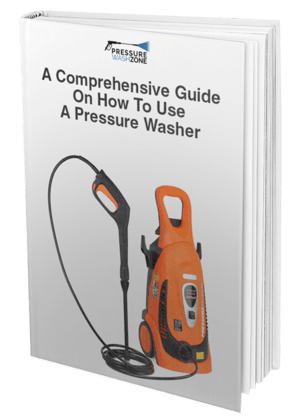 Download our FREE eBook guide and learn everything you need to know about selecting the best pressure washer that suits your needs. All stains are not created equal. When it comes to finding a solution for pressure washer sessions, it can be difficult to decide what to use. What are the best solutions for getting rid of stains? The truth is, that depends on exactly what surface your stain is on. That is the fastest way to decide what sort of solution for pressure washer to use. We’ve already given you a basic guide to using soaps. Now, we’re getting more specific. Read on for four different kinds of solution for pressure washer cleaning of stains. Concrete is quick to look dirty. With oil spots and grease from cars, this can be one of the hardest areas to keep clean. Sometimes, simply rinsing it off with a power washer isn’t enough. This solution for pressure washer solves that problem with a simple soap routine. Follow these steps to make sure that your concrete is clean in no time! Depending on the size of your area, you might have to work in multiple sections. Spray your first section with detergent. Let it set for 5-10 minutes. If it starts to dry within that time frame, spray it again. It’s important to let the detergent have enough time to work. After this time is up, switch to a high-pressure spray. Move in smooth, consistent motions so that you don’t leave streaks. You’re looking for a nice, even clean. Be very careful not to miss any spots. You might need to spend some extra time on spots to make sure that they are thoroughly clean. If necessary, go to your next section and repeat starting at step 2. The key to this solution for pressure washer is time. You don’t want to rush this project. If you do, there will probably be spots and similar things left over, making your cleaning look sloppy. A half-done job can be even worse than an undone job because the spots that aren’t clean are just that much more noticeable. So be sure that you leave enough time for you to complete this job thoroughly. Cleaning a deck can be especially difficult because you run the risk of messing with the stain and warping the wood. However, if you do it right, a solution for pressure washer cleaning a wood deck can be quite simple. Here’s one solution that can help to revitalize your deck. Remove all items on the deck. This ensures that you won’t accidentally break something in your attempts to clean. Sweep off any debris or branches. This will make stains easier to see. Apply a deck cleaner using your pressure washer, following manufacturer instructions. Use long, overlapping strokes to make sure that you don’t miss anything. Use a stiff scrub brush and work in the cleaner. This will help clean between corners and tight railings. Don’t let the detergent dry during this step. Switch to the widest spray nozzle and gently pressure wash your deck. Go with the grain of the wood and don’t get closer than six inches to the deck, or you’ll damage your wood. If necessary, reapply a protective wood stain. This might not have to be done with every wash, but you should still be doing it fairly regularly. This is a bit labor-intensive, but the results that come from it make this solution for pressure washer cleaning more than worth it. This will allow you to clean your deck without damaging or warping the wood. Just make sure that you follow the instructions carefully. The most important part is to stay safe and keep your distance while power washing the deck. If you get too hasty or too exuberant, you run the risk of doing damage to your deck, making things much worse in the long run. Siding can be difficult to clean because it is so fragile. But if you want to restain it, power washing it is a very important step in the process. This is a good solution for pressure washer cleaning when it comes to wood siding. Use a pressure level of 2000 psi, and an output of 304 gallons per minute. Use a nozzle that creates a 40-degree fan. For some harder to clean stains, you might need to use a 25-degree nozzle. To tackle mold, use a solution of bleach and water. For vinyl siding, there is a different kind of solution for power washing that you can use. Take 1/3 cup of powdered laundry detergent. Mix in 2/3 cup of powdered household cleanser. Add 1 quart of liquid laundry bleach. Add 1 gallon of water. To use this solution, put it in the power washer and use the following steps. For spots of mildew, use a solution of 9 parts warm water to 1 part liquid bleach before power washing. White vinegar can also be used to remove mildew. Power wash using the solution for pressure washer created in the previous list. (As with wood siding, using a 40-degree fan is probably best). Let solution for pressure washer sit for 10 minutes. No matter what kind of siding to use, there are some important things to keep in mind. For example, it’s important to direct your power washer directly at the siding of your house, and not at windows or doors. If you aren’t careful, you run the risk of damaging both the outside of your house and the inside if the power washer stream makes its way through the cracks. This is one of the hardest things to pull off when you aren’t a professional, so be very careful and cautious while using this solution for pressure washer cleaning. Power washing your car can be dangerous. You don’t want to damage the paint on your car. But if you use the right solution for pressure washer cleaning, you won’t have to worry as much about that. Use a pressure washer with a setting of 1200-1900 PSI and a 1.4-1.6 GPM. Use a 25 Degree tip for the pre-wash rinse and a 40-degree tip for rinsing off detergent. Park your car in an open space, away from other cars or objects. 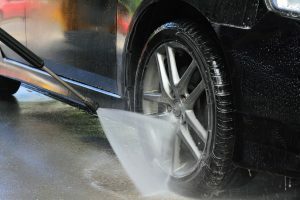 When washing your car, try to spray water downward on the car’s surface. Rinse the wheels as well as the entire body of the car. After the rinse, it’s time to use the solution. There is a fairly simple solution for pressure washer that you can make to clean a car. Mix both of these things with a gallon of hot water. Use this to clean your car. After this is done, rinse again. You might want to dry your car off gently with a towel to avoid any water spots. Washing your car with a power washer can be difficult, but not if you’re careful. It’s important to always check your power washer before using it. Quickly spray your concrete before you begin to ensure that you don’t accidentally have it on a higher setting. Be very careful with the more fragile parts of your car, like the rearview mirror. If you hit them at the wrong angle, you could damage them. If you stay careful, however, you will have no trouble when it comes to using a solution for pressure washer to wash your car. When it comes to power washing, you want to be careful. If you use the wrong solution, you could wind up putting your animals or even the environment in danger. If you’re working in an area where you can damage your lawn or something similar, you’re going to want to use a better solution. You can make a very simple solution using 30 percent distilled white vinegar and 70 percent water. This will make a solution that is completely safe for the environment. This solution for pressure washer can work for cleaning cement, brick, and even windows. Just make sure that you’re very careful and use lower settings so that you don’t damage anything. This solution works because vinegar has natural antifungal properties. This can help to keep your surfaces free from mildew growth. While this is a gentler solution than the others listed here, it can be used to get rid of less tough stains. And it has the added benefit of being completely natural. Looking for a different solution for pressure washer uses? If you’re looking for a different kind of advice, we offer all sorts of insight on how to properly use pressure washers. We offer a solution for pressure washer choices, usage, and even things like selecting the right pressure washer hose. Whatever question you want to be answered, we’re here to help you find it from the most authoritative sources that we can find. If you’re looking for a solution for pressure washer problems, look no further than our blog. We produce regular content on the subject of pressure washers.